The Violin Society Of America reflects a broad range of interests and concerns of those interested in violins and the art of making instruments and bows of the violin family. 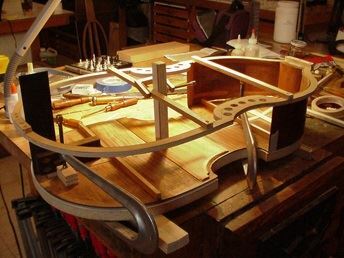 Founded in 1973, the Violin Society of America is a non-profit organization created for the purpose of promoting the art and science of making, repairing and preserving stringed musical instruments and their bows. Membership in the VSA is open to all who share an interest in the violin, viola, cello, bass and their bows, and thus reflects a broad and diverse range of interests and concerns, including craftsmanship, acoustics, innovation, the history of instruments and performers, technique, performance practice, repertory and other matters pertaining to instruments of the violin family. To achieve these goals, the VSA has offered a number of important services to its members and the stringed instrument community in general. In even-numbered years the Society sponsors its world-renowned competition for new instruments and bows. A convention is held annually, offering lectures, exhibits, concerts, trips and other activities of interest to the members. The VSA publishes the prestigious Journal of the Violin Society of America and VSA Papers, both with a variety of articles on the making, playing and history of the instruments. A newsletter with news of the organization, its members and related activities is published three times per year. The VSA, jointly with Oberlin College, sponsors workshops and holds an extensive collection of violin-related books. In 2004 the Catgut Acoustical Society joined the VSA as the CAS Forum. The purpose of the CAS Forum is to increase and diffuse the knowledge of musical acoustics and instruments, and to promote its practical applications.